A pair of tan heels is a wardrobe staple. And it's one that I'd somehow managed to overlook until recently. I always associate tan shoes with Summer so I think we can let it slide that I'd forgotten about them during Winter. 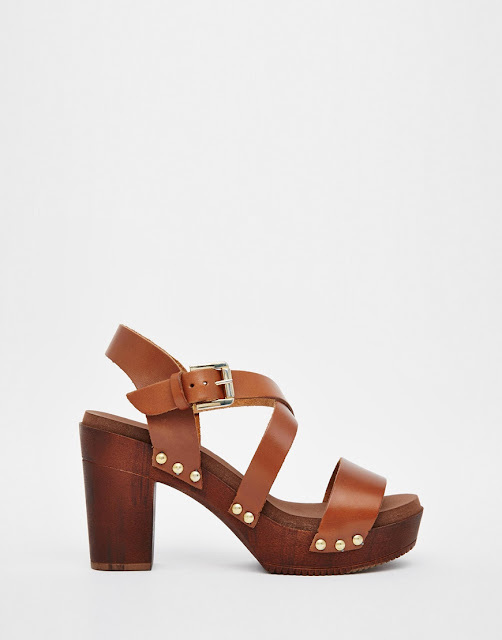 Nonetheless, welcome the Dune Tan Jaxon Leather Heeled Sandals (what a mouthful) to my closet! The best part about these shoes is that they're light! Most wooden shoes weigh a tonne and you're left feeling like a horse clip clopping around! I also LOVE the colour match between the wood and tan, spot on! The upper is leather and the straps are nice and supple. The foot bed is cushiony but kind of cheap plastic which is a shame. The bottom is also a weird plasticy material that I can already tell won't stand the test of time. The parts I find most challenging about these shoes is the lack of adjustability. The main strap does up across but the matching cross strap for it doesn't change, nor the one across the toes and being between sizes... well I find them a bit big. I've already had a couple blisters from flopping about in them! Overall, I'll give them a 6/10. I adore the way they look but they're not the greatest quality and they'll be a one Summer wear. On the plus side though, they're bringing out my 70's chick in the greatest way! Beautiful sandal. leather wooden color is more attractive. $5.40 CASHBACK offer on Dune Jaxon Black Leather Heeled Clog Sandals.